Killer sudoku is like a mix of sudoku and kakuro. 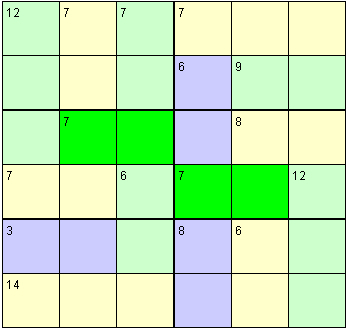 It can look quite daunting because there are usually no givens, that is to say, numbers placed in the grid at the start of the puzzle. However, instead there are dotted regions that are called cages, and the sum total of each cage is given. Thus if there is a cage with a total of '6' and three cells compose that cage, then you know those cells must contain 1,2,3 in some order: it is not permitted to repeat a digit within a cage. If you prefer killer sudoku puzzles for online use rather than print publication, then you can license our online killer sudoku player: take a look at the Online Killer Sudoku Player in action. We can supply an order of any size with quick turnaround times and meet any bespoke requirements. Simply Contact Us with your requirements, and we'll swiftly get back to you with a response and quote, if appropriate. 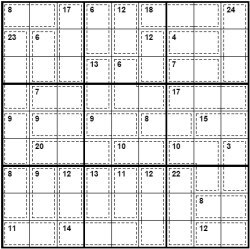 Publishers - Please contact us to buy Killer Sudoku puzzles for publication in your book, magazine, newspaper, any other printed media or online.